9 digits after 3.14 in a fun online math learning game. 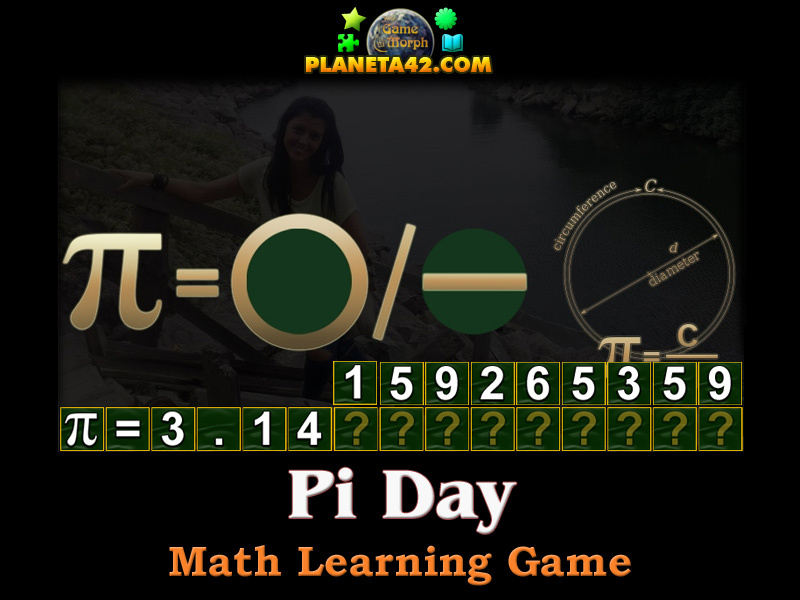 "Pi Puzzle" is a small knowledge level game, to sort the 9 numbers after 3.14 and celebrate the Pi day on March 14. Fun math game, suitable for online lessons and interactive classes. Free online game for desktop computers, laptops and tablets, which may be played in the web browser. Minute to win it game. How to play Pi Puzzle. In this game, you must complete and construct a 12 digits Pi number, where you have the first 3 numbers set. On the top of the screen there are more numbers. Drag and drop the numbers in the empty digit slots after 3.14. If you need to check and remind them, just look at the game picture. Know at least 2 more digits after 3.14 get +1 Knowledge Level. Gameplay movie on(coming soon) YouTube. Do you know, why we celebrate Pi day on March 14? Yes, it is the third month and 14 day, just like 3.14. The Pi itself is a very complicated phenomenon, and deeper you dig to it, more misterious it becomes. But we will leave it to the great mathematitions and have some fun with the game and celebrate the Pi day. Labels: Math Games , Learning Games , Number Games , Educational Games , Puzzle Games , Free Online Games.